The Veteran’s Service Dog is an alert dog that is specially trained for veterans with Post Traumatic Stress Disorder (PTSD). This is a mental disorder that veterans may suffer as they are deployed to war zones. The specially trained dogs help veterans to cope with stress caused by traumatic experiences in war zones. The dogs recognize the first symptoms of a nightmare and give a warning and also help to avoid stressful situations and are able to calm their “boss” and feel safe. This allows veterans with PTSD recover faster from their trauma and resume their normal lives. For the pilot, the project team are looking for Veterans with PTSD who wish to qualify for a Veteran’s Service Dog to improve their general life welfare. Other specific tasks can also be negotiated as part of the project. Selection of participants will be undertaken by a psychologist and instructors collaborating on the pilot. Successful applicants will then be put on a waiting list. The pilot will study fourteen veterans with PTSD – seven of which will work with a dog and seven will take part in the research without a dog for comparison. The Veterans Dog project is a collaboration of Service Dogs Netherlands, The Veterans House, Royal PIT Pro Rege and Dr. A. Wiersema-Ouwehand. 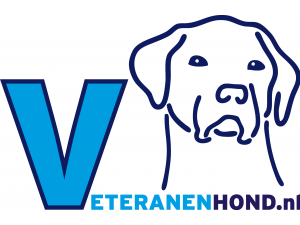 The partners are committed to promote the advantages of having a veteran dog with war veterans and raise awareness of the Veterans Dogs among a larger group of people in the Netherlands to raise funds for the training of the dogs. This entry was posted in Animal-Assisted Interventions, In the news, Research and tagged AAI, animal-assisted, animal-assisted interventions, animal-assisted therapy, mental health, PTSD, research, service dog on August 7, 2013 by SCAS. 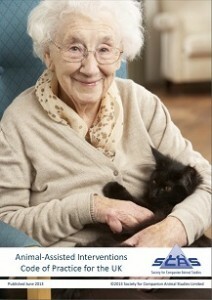 SCAS are delighted to announce the publication of the first Animal-assisted Interventions Code of Practice for the UK. As public awareness of the benefits of animal-assisted interventions increases and more providers are looking to set up programmes, there is an ever growing need to ensure a consistent, responsible and safe approach to these interventions. Working with a dedicated steering group drawn from our membership, many of whom are active in the field, discussions have been underway since July 2010 and has required a great deal of commitment and consideration from all involved. Having completed the first draft, the Code of Practice was submitted for consultation to organisations from the animal welfare and healthcare sectors as well as dedicated AAI providers and SCAS members*. Aimed at providers, the Code of Practice is intended to offer guidance on best practice for delivering AAI effectively and safely. It offers a unified, structured approach for providers in the UK, helping to ensure that both people and animals benefit from their involvement in AAI. With special thanks to all those involved in the development of the Code of Practice, without whose generous contributions, its publication would not have been possible. *A full list of the organisations who were invited to comment as part of the consultation is available upon request. This entry was posted in Animal-Assisted Interventions and tagged AAI, animal-assisted, animal-assisted interventions, animal-assisted therapy, Code of Practice, CoP on June 17, 2013 by SCAS.